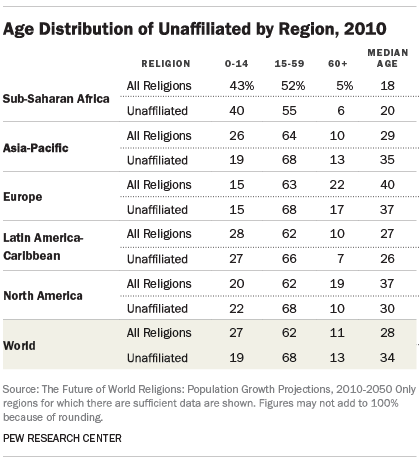 During the next few decades, the number of religiously unaffiliated people around the world is projected to grow modestly, rising from about 1.1 billion in 2010 to a peak of more than 1.2 billion in 2040 and then dropping back slightly.42 Over the same 40-year period, however, the overall global population is expected to increase at a much faster pace. As a result, the percentage of the world’s population that is unaffiliated is expected to drop, from 16% of the world’s total population in 2010 to 13% in 2050. 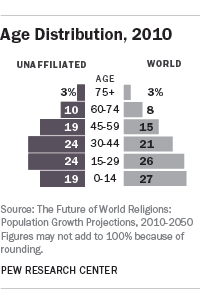 This decline is largely due to the advanced age and low fertility of religiously unaffiliated people globally relative to other religious groups. The three largest unaffiliated populations live in China, Japan and the United States; there also are significant numbers of religiously unaffiliated people in many European countries. All of these areas have older populations and lower fertility rates than the global population overall. The annual growth rate of the world’s population is expected to decline from 1.1% in 2010-2015 to 0.4% between 2045 and 2050. The annual growth rate of the unaffiliated is expected to be substantially lower, starting at 0.6% in 2010-2015 and turning negative around 2040 (representing not just slower growth but actual shrinkage of the population). 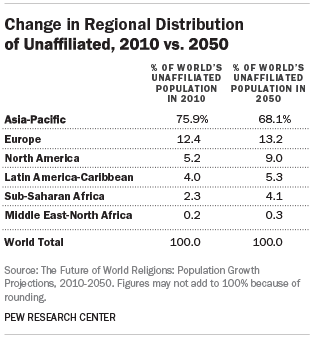 The religiously unaffiliated are heavily concentrated in the Asia-Pacific region, where 76% resided in 2010 and 68% are projected to reside in 2050. The share of the unaffiliated population residing in Europe is projected to grow from 12% in 2010 to 13% in 2050. 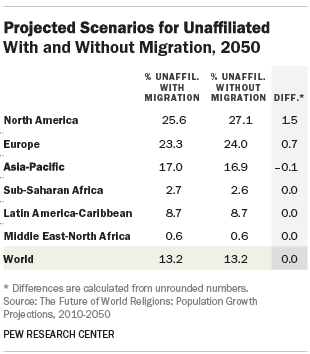 North America, which had about 5% of the world’s unaffiliated population in 2010, is expected to have 9% in 2050. The shares of the unaffiliated living in the three other regions are expected to increase modestly but remain relatively small. While the bulk of the world’s unaffiliated population will continue to reside in the Asia-Pacific region, the share of the region’s population that is unaffiliated is projected to decline from 21% in 2010 to 17% in 2050. Meanwhile, the share of Europe’s population that is unaffiliated will rise from 19% to 23%. The unaffiliated also will make up a growing share of the population in North America, rising from 17% to nearly 26%. The percentage of the population that is unaffiliated is expected to increase slightly in Latin America and the Caribbean between 2010 and 2050 and remain about the same in sub-Saharan Africa and the Middle East and North Africa. 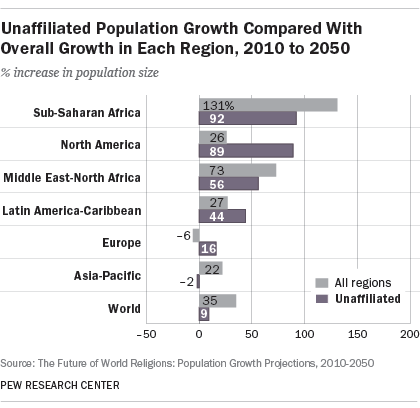 The religiously unaffiliated populations in North America and sub-Saharan Africa are expected to experience large growth in absolute size from 2010 to 2050. 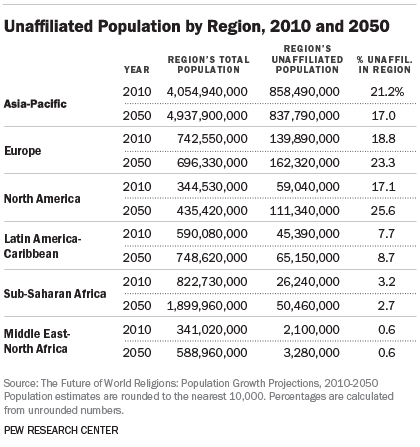 The religiously unaffiliated population in North America is projected to nearly double in size by 2050, growing by 89%. By contrast, North America’s total population is expected to grow only 26%. Sub-Saharan Africa’s religiously unaffiliated population also is expected to nearly double (increasing 92%), but this is less growth than is projected for the region overall (131%). The unaffiliated population in the Middle East and North Africa is expected to grow 56%, less than the region as a whole, while the unaffiliated population in Latin America and the Caribbean is projected to grow 44%, more than the region overall. Europe’s unaffiliated population is expected to grow by 16%, whereas the region’s overall population is expected to decline by 6%. In the Asia-Pacific region — home to the largest unaffiliated population — the number of unaffiliated people is projected to decline by 2%, while the region’s population as a whole is expected to increase by 22%. All 10 countries on this list are expected to see their overall populations decline as a share of the world’s population. Collectively, these countries held 33% of the world’s population in 2010. By 2050, their share of the global population is expected to decline to 25%. 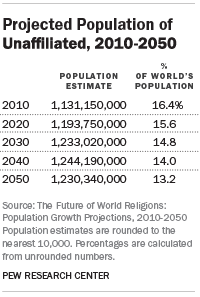 China alone is expected to shift from having nearly 20% of the world’s population in 2010 to 14% in 2050. In six of these countries (Japan, the United States, Vietnam, Germany, France and the United Kingdom), the share of the population that is unaffiliated is expected to increase in the coming decades. But the potential growth of the unaffiliated is constrained by the fact that these are all countries with overall populations that are shrinking as a share of the world’s people. The religiously unaffiliated are heavily concentrated in relatively few countries. As of 2010, about 86% lived in the 10 countries with the largest unaffiliated populations. Consequently, the demographic trajectory of these countries will help shape the projected size of the global unaffiliated population in the decades to come. 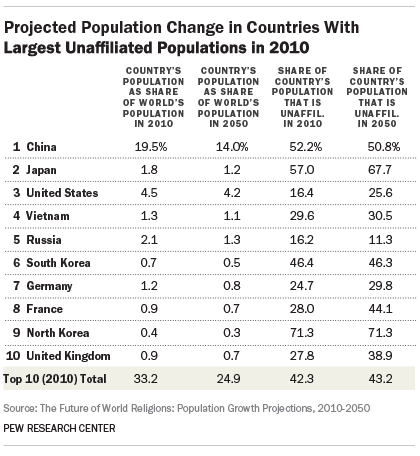 In 2010, more than six-in-ten (62%) of the world’s religiously unaffiliated people lived in China. The next largest religiously unaffiliated populations were in Japan (6% of the global total), the United States (5%), Vietnam (2%) and Russia (2%). In 2050, China is expected to remain home to a majority (54%) of the world’s unaffiliated population. 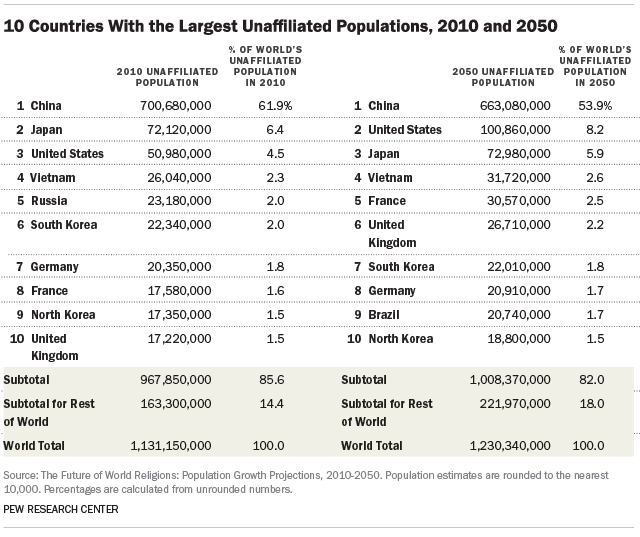 The United States is expected to have the world’s second-largest unaffiliated population (8%), surpassing Japan (6%). 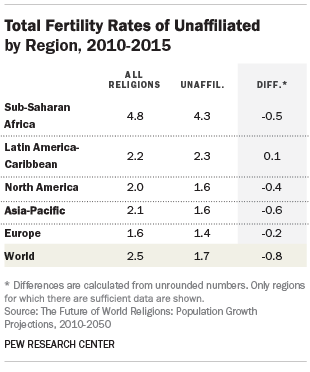 In general, the religiously unaffiliated have lower fertility levels than the world population overall. Globally, the Total Fertility Rate (TFR) for the unaffiliated is 1.7 children per woman in the 2010-2015 period, while the rate for the world’s entire population is 2.5. 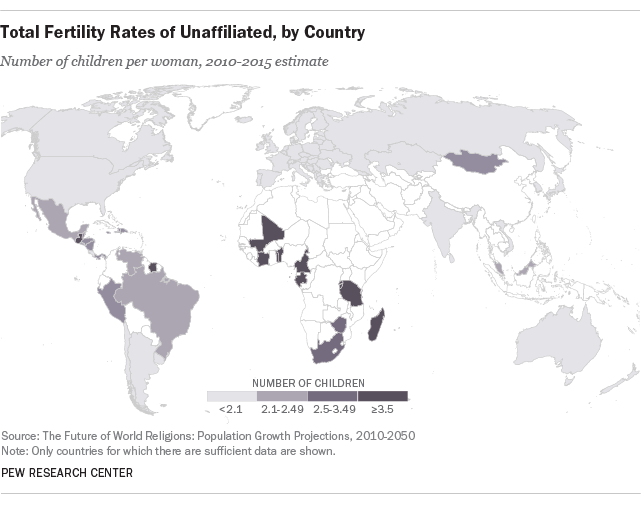 The fertility of the unaffiliated is highest in sub-Saharan Africa (4.3), followed by Latin America and the Caribbean (2.3). In the other regions where data on the unaffiliated is available, their fertility rate is below replacement level, which is typically 2.1 children per woman. The countries with the highest fertility rates among the unaffiliated in the 2010-2015 period are concentrated in sub-Saharan Africa. In Europe, North America and many Asian countries, fertility rates for the unaffiliated are below replacement level. (See map on 87.) For example, the unaffiliated fertility rate is 1.7 children in the United Kingdom, 1.6 in the United States and 1.5 in Japan. In Spain, it is just 1.0, and in Austria it is 0.9. Globally, the religiously unaffiliated population was older (median age of 34) than the overall population (median age of 28) as of 2010. In Asia and the Pacific, where most of the unaffiliated live, the median age of the unaffiliated (35) was six years higher than the regional median (29). While sub-Saharan Africa is the region with the youngest median age of religiously unaffiliated people (20), the region’s overall median age is even younger (18). In other regions, the unaffiliated tend to be younger than the general population. In North America, the median age of the unaffiliated (30) is seven years younger than the regional median (37). In Europe, the median age of the unaffiliated (37) is three years below the overall median (40). And in Latin America and the Caribbean, the median age of the unaffiliated (26) is one year younger than the regional median (27). In the main projections model used in this study, religious switching is factored into the population projections for all the countries for which sufficient data on recent switching patterns are available (70 countries). In an alternative scenario, however, no religious switching was modeled in any country. Comparing results between these two scenarios gives a sense of how much impact religious switching is expected to make on the size of the religiously unaffiliated population in the years to come. 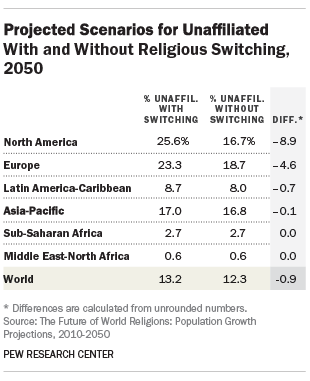 Worldwide, religious switching is projected to have a modest impact on changes in the unaffiliated population. The unaffiliated make up about 1% more of the global population when switching is taken into account (13% vs. 12%). Switching makes more of a difference in some regions than others. The projected impact of switching is greatest in North America, where the projections that include switching have the unaffiliated population about 9 percentage points higher than without switching (26% vs. 17%). Slightly more than 850,000 people with no religious affiliation are expected to move from one region to another region between 2010 and 2015. About 270,000 are forecast to move from the Asia-Pacific region (mainly from China) to North America. An additional 180,000 religiously unaffiliated people are projected to move to North America from Latin America and the Caribbean. Despite this movement of people with no religious affiliation, migration is expected to have a fairly modest impact on the unaffiliated share of the population in the regions for which there is sufficient data. The impact of migration can be seen by comparing results from the main projection scenario, which includes expected migration patterns, with an alternative scenario that does not attempt to take migration into account. 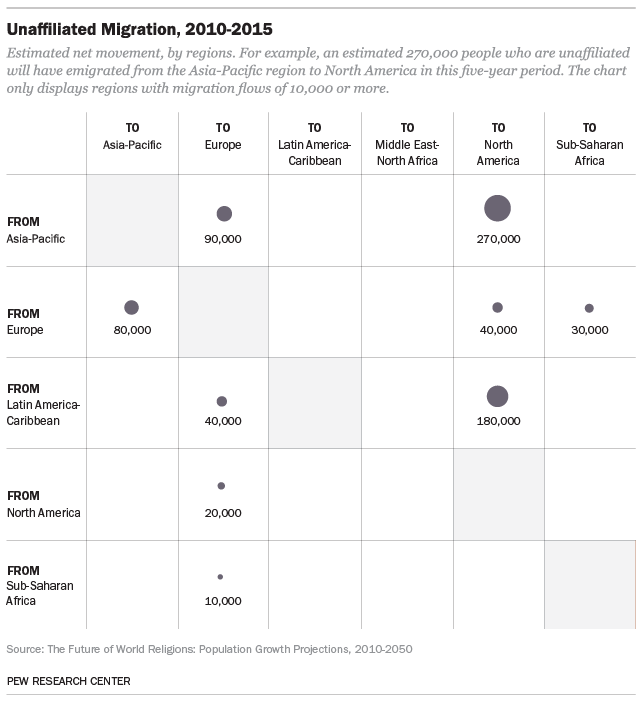 Overall, the religiously unaffiliated shares of the immigrants moving to North America and Europe are expected to be smaller than the religiously unaffiliated shares of the populations already in those regions. If there were no further migration – if all movement of people across international borders were to stop – the projected unaffiliated shares of Europe (24%) and North America (27%) in 2050 each would be slightly higher than in the main scenario (Europe 23%, North America 26%), which factors migration patterns into the projection models.